Preswylfa Guest House01654 710005work Guest HouseJane and Lawrence Garvey welcome you to their family run Guest House. Within easy walking distance of high street, beach and other local amenities. 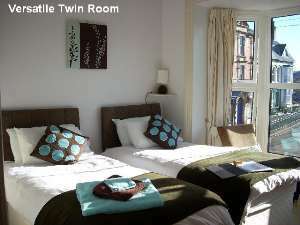 Our rooms are a luxury double, twin and single room. There is also a guest lounge. We serve a full Welsh breakfast with a wide range of options. Evening meals and packed lunches are also available. Sample menu on website. We are a small business who mainly cater for couples. We can provide extras upon request and are willing to work with people to make it a "special break"
Jane and Lawrence Garvey welcome you to their family run Guest House. Follow A493 into Tywyn. From the main line railway station turn into Pier Road and Preswylfa is on the right before the railway bridge. 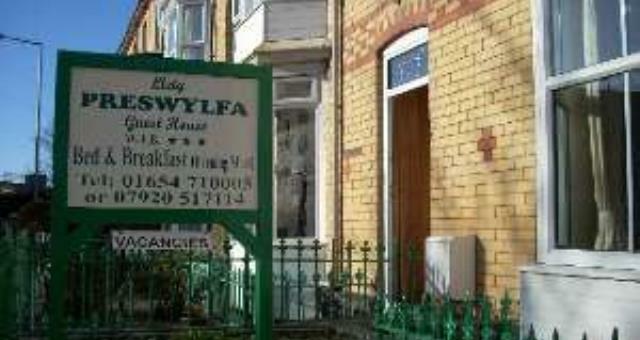 Preswylfa Guest House is situated in the centre of Tywyn at the west end of the high street opposite the main line railway station. It is a tall thin Victorian house with lots of stairs. There is a private parking area to the rear accessed via a narrow private road. This is within walking distance of the property. Access is through the front door 800mm wide and is up one step, at this level is the dining room. There are then two flights of eight stairs with a good banister to the bedrooms. There is a toilet on the landing half way up to the bedrooms. The double and twin rooms are ensuite, with showers which have a small step up into the shower tray of approximately 100mm. The single room has sole use of a shower room with a small step up into the shower tray of approximately 100mm,.which is up a further eight stairs from the bedroom. Bedrooms have digital tv/dvds with remote controls, corded kettles and hairdryers. We would welcome assistance dogs and would try to provide any necessary assistance up to 23.00. We would offer any assistance during the night in the case of an emergency. We aim to ensure that all our guests have comfortable facilities, all requests are dealt with efficiently and all guests are made to feel welcomed throughout their stay.